With so many people writing about their dining experiences, there are many articles these days dedicated to peoples pet hates in restaurants. We even published one of our own on this blog earlier this year ‘10 Things We Hate When Eating Out‘ . 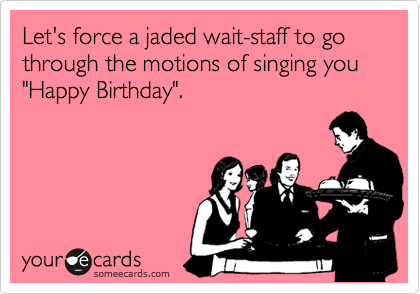 But service with a smile isn’t so easy: from bad jokes to bad manners to bad tips, clients aren’t always a piece of cake for waiting staff. Inspired by a column in The Montreal Gazette about a food writers bad restaurant experiences , two waiters have come up with their own list of grievances about restaurant customers and their behavior. One of the main reasons we are reprinting this list is no 15. Those of you that regularly follow this blog will know that our esteemed leader is quite an opinionated veggie and this complaint made us laugh out loud! We hear these jokes multiple times a week, and every time that we have to pretend to laugh at them a piece of our soul dies. 2. Allergies and intolerances and gluten free, oh my! Client: I’m allergic to nuts. Server: Well the plate you ordered has nuts in it. Would you like something else? Client: No I’ll still take it. Server: Great! Do you have any other allergies that you made up? 3. Can we have a booth? “A booth please.” “We would like a booth.” “Is that booth available?” Why are people so obsessed with booths? You’re going to be here an hour at the most. Just sit at the table and eat your food. 4. Don’t snap your fingers at your waiter. EVER. Please remember that we are servers not servants. Nor are we dogs. 5. Pay attention to what you are ordering. Very often people don’t read the menu descriptions or are unaware of what they ordered and then blame the waiter for bringing the wrong item. We then have to return the plate to the kitchen and get in trouble with the cooks, our manager and the owner because of your mistake. In your eyes it’s always the server’s fault but let’s look at this logically. Who is more likely to make a mistake? You, who have never seen the menu before and don’t know what you’re talking about? Or us, who work at the restaurant every day (sometimes for years), who know the menu inside and out and who wrote down exactly what you said? I think the person with the written documentation of the conversation is probably the one who is right. 6. Coming in to eat 10 minutes before closing. Most restaurants require the servers to accept clients up until the minute before closing. Please have some common courtesy and don’t arrive in an empty restaurant two minutes before closing and order dinner, especially if it’s a well-done filet mignon with a bottle of wine. Don’t be an inattentive parent who lets their child(ren) run wild, tripping servers, disturbing other tables and running into the kitchen, while you enjoy a nice conversation at your table. We’re not daycare workers and as much as we pretend, we don’t like your kids. 8. Don’t compliment the service and then tip below 15%. Every waiter has been told by a customer that they gave great service — right before they were handed a poor tip. Servers pay taxes and a percentage of their sales to the house, usually two to six per cent, regardless if they get tipped or not. So remember: Servers can’t pay their bills with compliments. In server lingo, a camper is someone who stays at the table all night. Servers need to turn over their tables in order to make money, so please don’t stay for hours after you’ve eaten, sipping water and asking for refills on your coffee. You have no reason to be there if you’re not eating or drinking anymore, so please leave. This is a restaurant, not a campsite. 10. Can I get this to go? Don’t make us pack up food that we both know you’re never going to eat. How long do those soggy fries stay in your fridge before you throw them out untouched? 11. There actually is such a thing as a stupid question. Can I get the burger for cheaper if I don’t want onions? Client: What beers do you have on tap? Server: Guinness, Molson Ex, Rickard’s Red and Heineken. Client: Do you have Samuel Adams? Client: Why is our food taking so long? Server: Because you ordered a steak well done and it’s only been six minutes. 12. Can you sing Happy Birthday? 13. Don’t say that you’re ready to order when you’re not. Don’t pull over your busy server saying that you’re ready to order and then look at your menu and say “Ummmmmmm.” Food and drinks have to be brought to tables, orders have to be taken, bills have to be paid, and tables have to be cleaned, all while you’re debating what to eat. Servers are very busy, so please respect our time. 14. Don’t laugh when you order fries. Why do women always laugh when they order fries? Guilt? We both know that you’re going to order them. No need to laugh. Client: What do you have for vegans? Server: I can get you some olives and maraschino cherries from the bar. 16. Don’t ask us which plate we like better. Unless we’re eating it with you, I don’t see how our opinion really matters. Unless you’re in a diner or McDonald’s please don’t barrel past the hostess stand, sit at a table and then look around wondering why you don’t have menus. The hostess that you just walked right by is there for a reason. 18. No, I’m not a student, and, yes, this is my real job. Servers always get asked if they are students or if they have another “real” job. As harmless as this question seems to you, it is in fact, pretty insulting to your server. How would you feel if you were at work and people constantly asked you if this was your real job or if you were going to school so that you could get a better job someday? You may just be curious or making conversation but please realize that you’re telling your server that they have a crappy, meaningless job that they can’t possibly like or find fulfilling. Please try to fathom that some people actually like being servers. Server: Would you like anything else? Client: Some more ketchup, please. Your server has now walked half a marathon when they could have done all that in one trip. Please don’t make your server do any unnecessary trips. Their legs get tired, too. 20. Please don’t be rude. Please remember that we are people, too. We’re there to help you have a good time and enjoy a nice meal out. We’re not a punching bag for you to take your bad day out on, we’re not there to be degraded, and we’re not there to bow to your every demand. So please don’t ignore us when we come to say hi and don’t berate us for things beyond our control like prices, portion sizes, restaurant atmosphere and the loud table next to you. We are your sons and daughters and sisters and brothers and neighbours and cousins and friends. We deserve to be treated with respect and courtesy just like everyone else. Thanks, and remember to tip your servers! Authors; MARC LEWIS AND EVELYN LEBLANC – two waiters from Montreal printed courtesy of The Montreal Gazette November 26, 2013.